It saddens me to hear about yet another indie bookstore facing hard times. Though I can't claim to have been a regular at the old location, I've always made a point of stopping by THIS AIN'T THE ROSEDALE LIBRARY at its new location in the Kensington Market, whenever I make it to Toronto. THIS AIN'T is best known for their amazing small press stock but I was surprised to learn that they've held ties in the comic world as well. 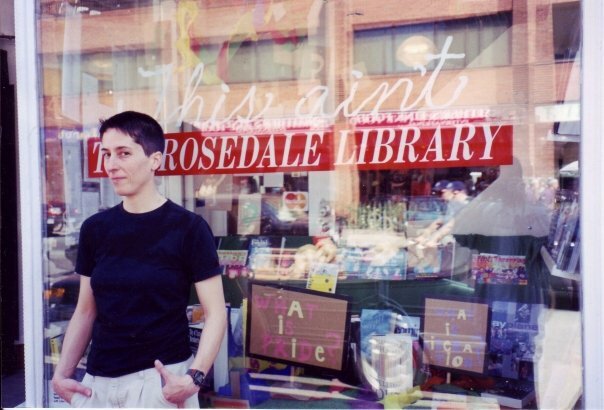 Above: Alison Bechdel. 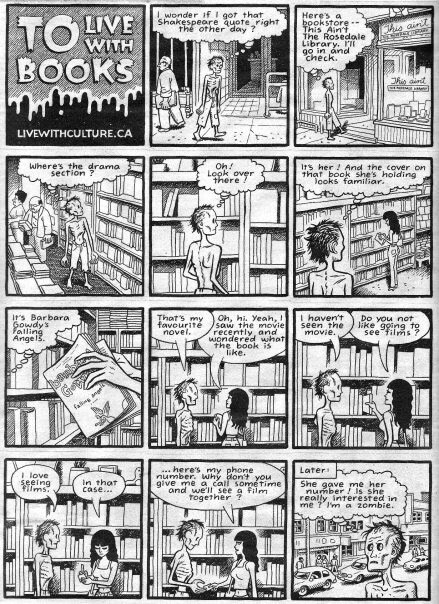 It's funny, the title of this Chester Brown comic is "To Live With Books" but if I could pose a new question today it would have to be, can you live without bookstores? Sure, there is amazon, yes, you can buy books for less and have them shipped to your door. But where will the authors read? Where will your kids get a feel for good books, will amazon serve you a glass of wine while your favorite author reads from their new book? WHERE WILL ZOMBIES MEET THE LIVING? So go read their statement, donate if you can, read the Globe & Mail article and I urge you to keep visiting bookstores, they are for you- Make them yours. Where else is young Lynda Barry going to sign books for young beret-sporting gentlemen?